Today I went to the Clinton-Bailey Market in my Zumba clothes because I forgot my sandals and so could not change into the dress I had brought along. Ha, ha! I looked like a Moroccan, running around in my pink and purple. As a mental exercise I am going to try to tally up everything I bought. Let me think. Big thing o' tomatoes, $5. Use 'em or lose 'em peppers, $4. I was good and used up all the peppers I bought last time I did this. So as a reward I let myself buy more. Corn, 12 ears for $3. That is a term I love, an ear of corn. Is there anything else there is an ear of? I think not. So far we are up to $13. Oh! I bought a big cantaloupe for $1. Now it is $14. I know I bought other stuff. Let me continue to think. Concord grapes: $2 for a quart. I ate most of that quart of grapes because I had forgotten to eat breakfast, plus they were so good and so sweet. So I had to buy another quart, and that is another $2. Gala apples, huge basket for $2. 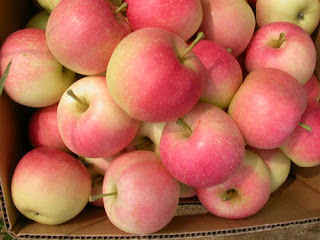 It is a beautiful apple, the Gala apple, flushed with pink. Leonard Pennario used to play the Buffalo Philharmonic Orchestra gala, back when Josef Krips was conductor. And you wondered how Pennario would figure in this post. That is how. 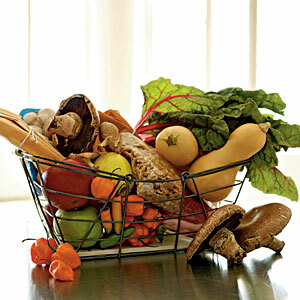 Back to my market haul. Did I forget anything? I think that is it. Plus my brother George dropped off peaches and cider. I have made peach chutney. But back to my total. It adds up to $22. I would say I got my money's worth!